Now is a great time of year to get some updated portrait images of your family. These summer mini sessions are perfect for families, couples, kids, friends or siblings. Fun, fast and fabulous – we know you’ll enjoy these sessions. All the information is below so get in quick to secure your booking! 2 mat prints (8×10″ – image 5×7″) – what are mat prints? To secure your booking, fill in the form and pay via PayPal, nominating your preferred day (your actual time will be scheduled prior to the sessions). Our Summer portrait mini sessions are now over. If you missed out, send us an email and we’ll keep you updated next time we have some mini sessions! Orders can be placed via the online gallery and must be purchased within the 4 day timeframe. 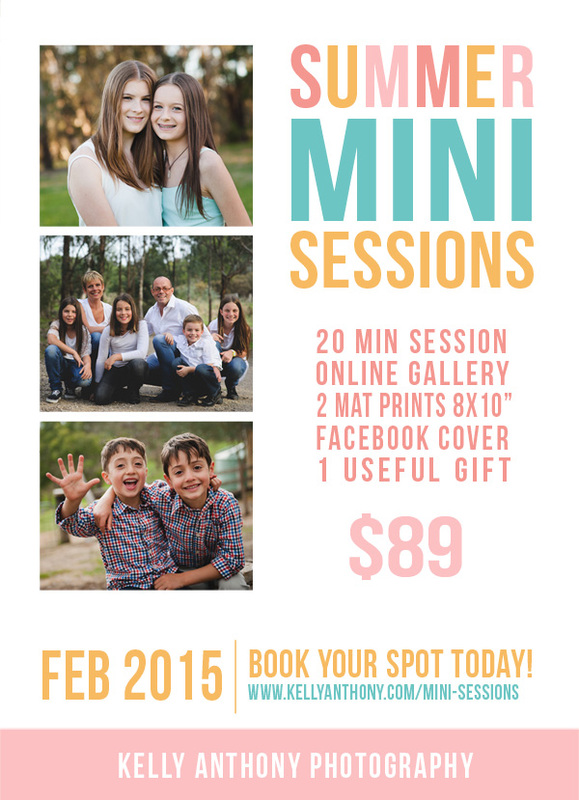 Mini sessions are for up to 5 people. Sessions dependant on weather conditions and will be rescheduled if bad weather. Our standard portrait model release is required to be signed. All pricing is excluding shipping of products (products can be picked up or delivered).